Have you been putting off deep cleaning your home? I’ve been working on it for a few weeks now and I’m using Young Living™ Essential Oils to get the job done safely! 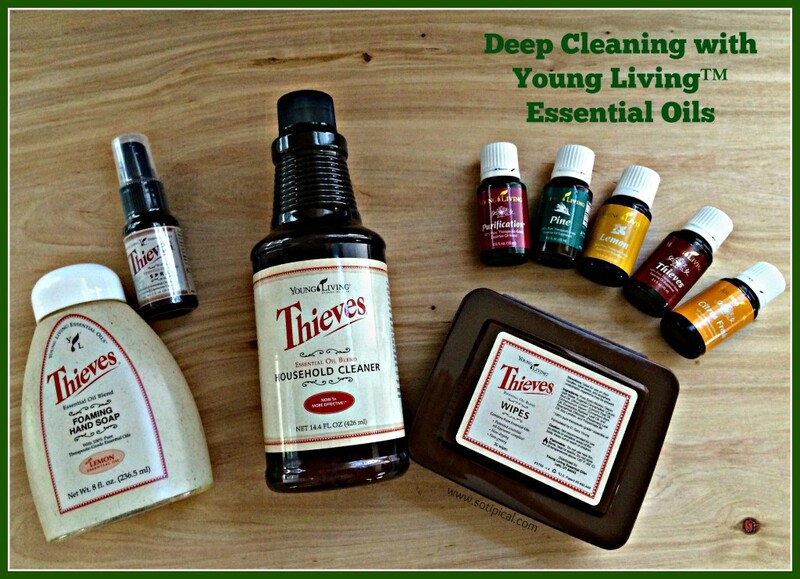 Awhile back, I was contacted by Young Living™ to ask if I would be willing to try out some of their cleaning line and write about my experience. Instead of using them all at once, I slowly incorporated them into my routines to see if how I liked it and whether we noticed a difference in our home. The other reason I wanted to try them is because we have allergies and I try to eliminate irritants and go a more natural route as often as possible. We suffer from sinus headaches a lot and they are often triggered by strong smelling fragrances and household products. I have been using white vinegar and baking soda to clean with for a few years now but my family doesn’t care for the smell of vinegar throughout the house. During the conversation I had with Young Living™, once she mentioned that I could use the oils mixed into my cleaning solution, a lightbulb went on in my head and I immediately said YES! I never thought to add anything to my vinegar solution and I couldn’t wait to try it. Trial #1 – We have 3 little dogs. The youngest dog is pad trained and is having a hard time transitioning to “going outside”. Another one always has bad breath and likes to lick her bed. Am I painting a nice stinky picture here??? I can’t get the bedding washed every single day and though I am changing the pads several times per day, the dog’s corner smells like dog if I don’t mop the area daily. I hadn’t found any type of deodorizer that didn’t make the area smell worse. I read that the Purification® oil(combination of Citronella, Lemongrass, Lavandin, Rosemary, Tea Tree, and Myrtle oils) was good for freshening the air and eliminating odors so I decided to try it in the dog’s area. I don’t have an oil diffuser, but a friend told me that I could apply the oil to a cotton ball and place it in the area I would like to freshen. Before I even cleaned the area that day, I decided to test it out. I put about 5 drops of the Purification® oil on a cotton ball and placed it in a small cup near the training pad. I left the area and continued with other chores for about 30 minutes and came back to check. The stinky dog smell was GONE! The air was fresh and smelled great! I couldn’t have been more pleased with the result! 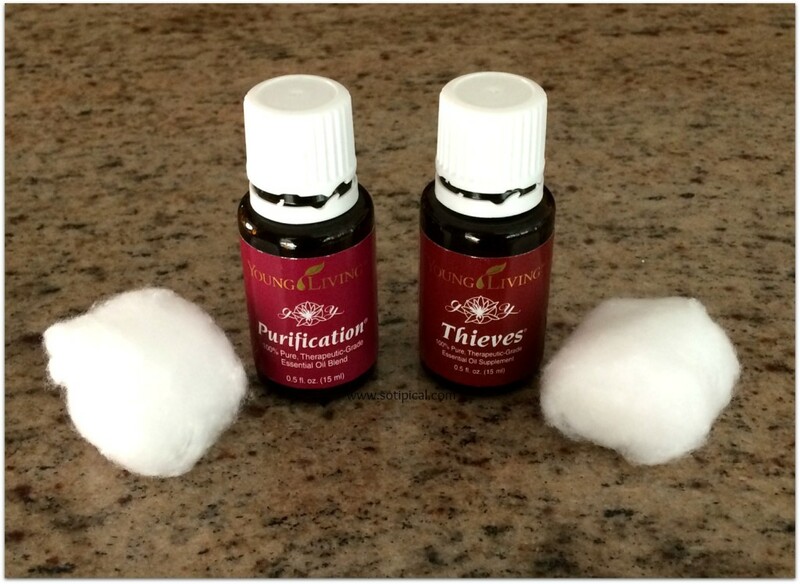 I have also experimented with using Thieves® oil as a room deodorizer as well and it also did an amazing job. 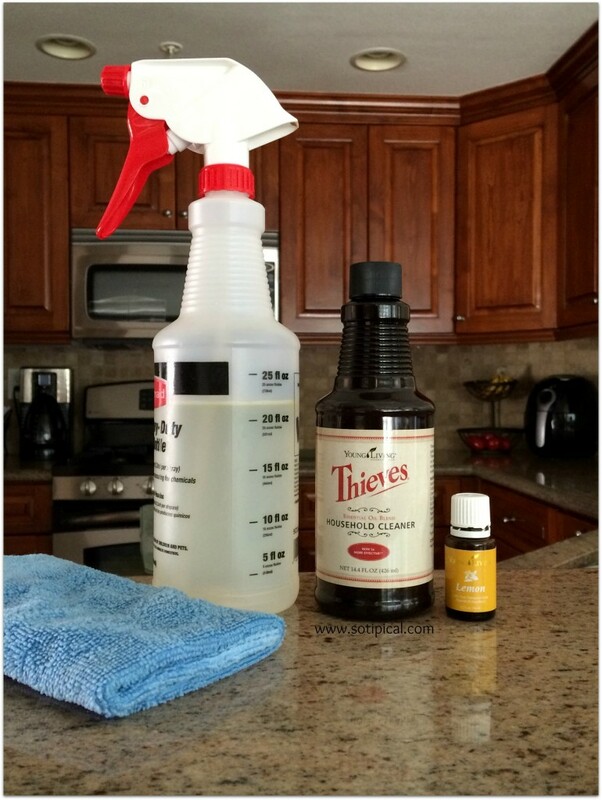 Trial #2 – I always have a spray bottle of vinegar and water for cleaning spills, messes, etc. As mentioned, the kids especially don’t like the smell of vinegar and won’t use it to clean up after themselves. I added a capful of Thieves® Household Cleaner to my spray bottle, and added a couple of additional drops of the Thieves® Essential Oil. It really changed the scent. I could now smell the hint of cinnamon bark and cloves over the vinegar. I’m using it everywhere! I’m cleaning the counters, the stove, microwave, bathrooms and its fantastic! Trial #3 – When I mop the tile, I use hot water and white vinegar. Again, I get a whole lot of “It stinks in here! Why did you have to use the vinegar again, blah, blah, blah…” I read in the brochure that came with my cleaning products that the Pine Oil is great for mopping. I prepared my bucket of hot water and vinegar, then added 3-4 drops of Pine Oil. It smelled so fresh and clean. I got the kitchen and bathroom floors clean and I had NO complaints! Trial #4 – Carpet and upholstery deodorizer! I didn’t have a small glass spray bottle, which is most recommended for this, but I made a small amount in a plastic spray bottle. 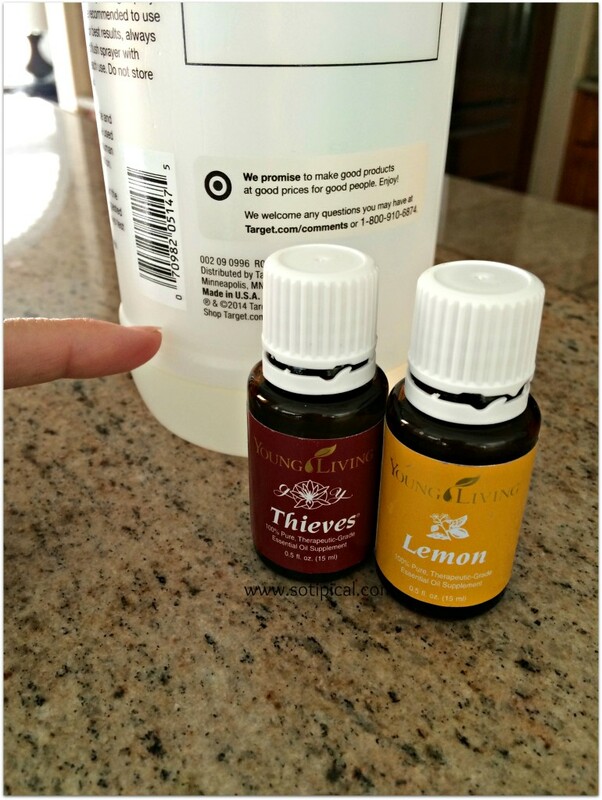 I used about 1 cup of water and added 3 drops each of the Lemon(or Citrus Fresh) and Thieves® oils. I sprayed it on my carpets, microfiber sofa and the dog beds. It worked so well, I couldn’t believe it. I have my carpets cleaned twice per year. I’m coming up on carpet cleaning time and I feel like my carpet was starting to smell a bit musty and stale. Between dogs laying in sun spots, kids tracking in dirt, stinky feet, etc., and when I got down on the floor and took a big whiff, there was no stale or stinky smell! 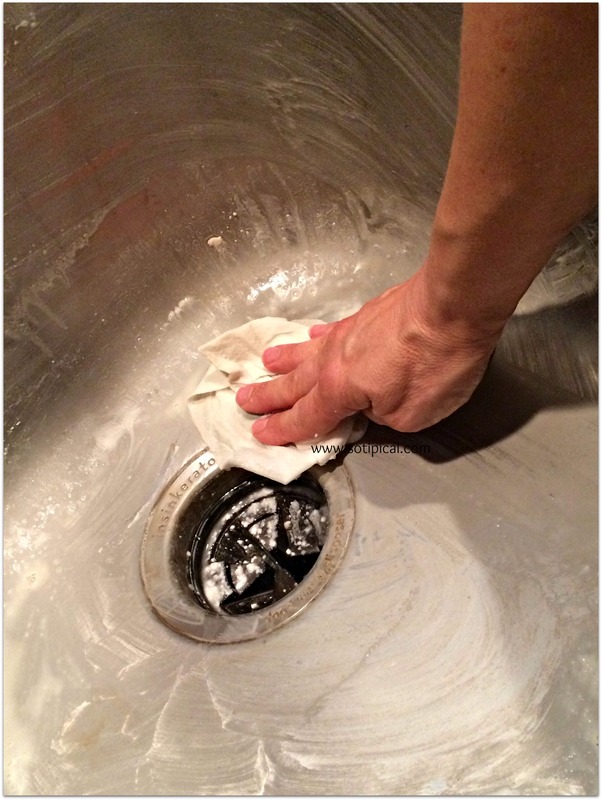 Trial #5 – Cleaning my sinks. I read that you can make a paste of Thieves® Household Cleaner with baking soda to form a thick paste. I used this scrub to clean my kitchen sink. It worked really well and my sink was free of odor and grime. I have been using it for my sink since! Bottom line is that I am sold on using these oils in my cleaning regimen, and not just for deep cleaning. I will continue to use them even for everyday cleanup. I encourage you to look into trying this for yourself. There are countless pins on Pinterest, reviews and blog posts out there, outlining how to use this line of cleaning products in your home. Take a more natural approach and rid your home of harsh chemicals. Its better for you, your family and your pets! Disclosure: This is NOT a sponsored post. Though I was sent products for review purposes, the opinions shared in this post are 100% my own and have not been influenced in any way. I did not agree to write a positive review in exchanged for the oils. I agreed to try, evaluate and honestly share my experience using these products.